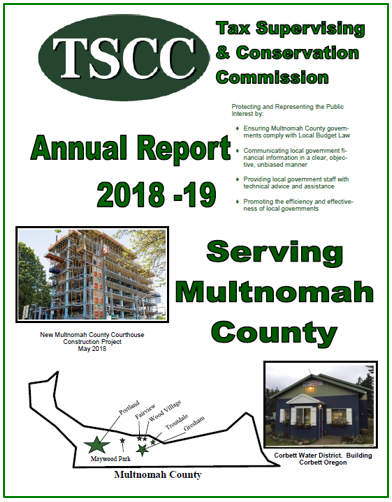 The Tax Supervising and Conservation Commission’s 2018-19 Annual Report is now available. The Commission has published this report annually since 1921. This is volume 96. The report is unique to the state of Oregon: Multnomah County is the only county in the state to produce such a comprehensive report on local government and educational district finances. TSCC, the entity that creates the report, is a state function, however, independent of the county and governed by five commissioners appointed by the Governor. The report contains budget, property tax, and debt information on forty-one jurisdictions principally located in Multnomah County. The jurisdictions range in size from small water districts with no employees and fewer than 100 customers, to the City of Portland, with a $4 billion budget and over 5,600 employees. 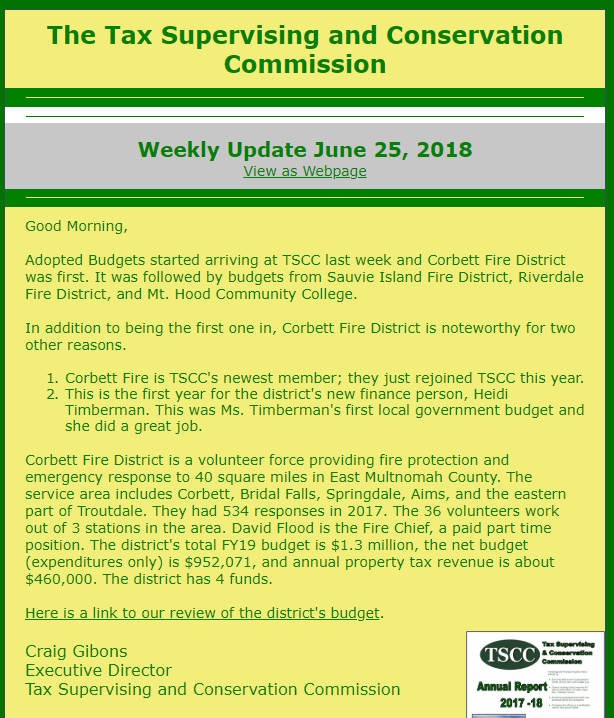 We post the report on the TSCC web site in easy-to-use FlipViewer format here. Users can search it and download it. It can be annotated, highlighted, bookmarked, converted to PDF, and copied. If you would like a hard copy of the report, we can send that to you, too. 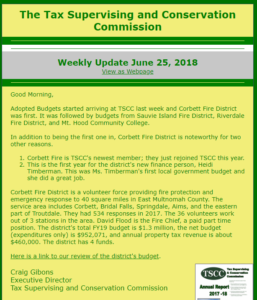 The TSCC Weekly update is a compendium of recent news and information for and about local governments and school districts in Multnomah County and state-wide. Subscriptions are free and users can easily unsubscribe.